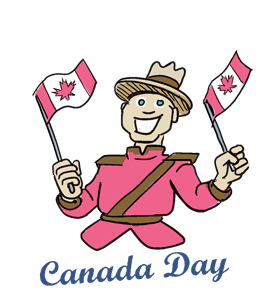 Canada Day celebrates Canada's independence from Britain on July 1, 1867. Prior to 1867, Canada was a British North American Colony composed of present day Ontario and Quebec. On July 1st, 1867, Her Majesty Queen Victoria of Great Britain officially proclaimed the Confederation of Canada's founding provinces, Ontario, Quebec, Nova Scotia and New Brunswick and the new Dominion of Canada became a self-governing body within the British realm. Although it was a self-governing body, Canada did not attain legislative independence from Britain until the signing of the Statute of Westminster on December 11, 1931. July 1st, originally named Dominion Day, was renamed Canada Day and made an official statutory holiday in 1983. On July 1, 1980, O Canada was named the official national anthem. The Queen of Canada, Queen Elizabeth II, is sometimes in attendance at Canada Day celebrations held at Parliament Hill, Ottawa, Ontario. Although the Dominion of Canada began with 4 provinces (Ontario, Quebec, New Brunswick and Nova Scotia), it rapidly expanded in the years following Confederation. Manitoba and Northwest Territories (NWT) joined in 1870, British Columbia in 1871, Prince Edward Island in 1873, the Arctic Islands joined the NWT in 1880, the Yukon in 1898, Alberta and Saskatchewan in 1905 and Newfoundland and Labrador in 1949. Finally, in 1999, the NWT were split in order to create the new territory of Nunavut. Attend the International Freedom Festival by visiting Detroit, Michigan or Windsor, Ontario. Watch the large firework displays in Toronto, Vancouver and Ottawa. Ottawa's fireworks are located right near the Canadian Parliament and can be watched on boats in the Ottawa River or the Rideau Canal. Be sure to wear red and white and decorate yourself with as many maple leaves and possible. Attend a local parade in your home town. Get outdoors - go rafting, hiking, fishing, or just take a walk in the park.